Since the the introduction of “Federally Insured Banking” by FDR, the general public consensus has been that our money is safe in banks. Over the course of history central banks have aligned themselves with political forces and have abused their power to the detriment of bank account holders (the citizens). Back in April 2013, the citizens of Cyprus, Greece learned that when their central bank makes bad lending decisions, it could very well could destroy half of their life savings. Three Cyprus banks experienced a crisis in 2013, and they ran to the European Union looking for a bail out. But they were denied! What happened next? A new concept called a “BAIL IN” was introduced. All account holders in the three financial institutions in question had a “one time” wealth tax applied to the balances of their accounts. This equated to up to 40% of everyone’s total savings! Just imagine that you were finally ready to buy your dream home, you had all $350,000 in the bank ready to go. But the next day, you wake up to a new balance of $200,000. $150,000 was essentially stolen from you because you chose to save it where you thought it would be safe.. the bank! Banks practice something called fractional reserve banking. What this means, is that they don’t have to hold your money in the bank. And for every dollar that your bank has on the books, it is allowed to lend out many times more than that to borrowers. Basically, if you deposit $100 in your account, your bank can then lend out $900. 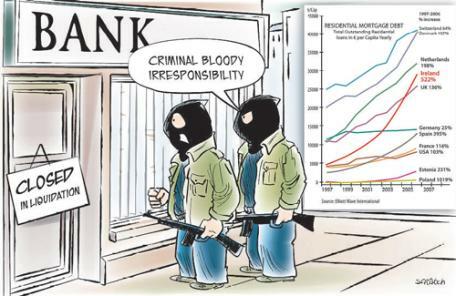 The banks are in the business of creating debt, and their using your money to do it irresponsibly. You probably heard of this term in the news whenever the Federal Reserve’s money printing practices are discussed. “Quantitative Easing” is when the Federal Reserve prints more US dollars into the world’s money supply. The long term effect of quantitative easing, is that It makes our US dollar currency worth less. It is a very simple concept of supply and demand which erodes your buying power. 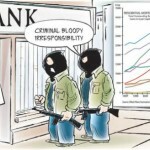 Another reason why your money is not only unsafe in banks, but also unsafe being held primarily in USD! And this is why so many people are looking for reliable ways to diversify out of the dollar before it’s value goes to zero. The central banking system will impose limits on access to your money. You have to play by their rules! For example look at daily withdrawal limits and international wire transfer fees. They limit how much money you can take out and make it cost prohibitive to move it around. Were you aware that your government also forces your bank to comply with ridiculous anti-money laundering laws that unfairly restrict your ability to use and move your own money as you please? Some of these laws involve reporting requirements on all transactions that are over $10,000 USD. Or reporting on a series of transactions which appear to be attempts at avoiding the $10k reporting threshold. Your bank is required by the government to spy on you and how you use your money. And of course hand that information over to the government. Other types of limitations involve limits on international transfers. Moving money around the world is not only cost prohibitive but limited in access. Many banks out there do not even provide the service! So let me know… is your money truly yours if you can’t actually use it, withdraw it, and spend it at your own discretion? Logic would say no. BAIL Ins Are Now Considered A Good Solution? The International Monetary Fund has publicly stated that the Cyprus Model of “bailing in” the insolvent banks is a good strategy. But can only be successful if the account holders do not try to take their money before the bail in happens. And ironically the United States publicly agreed. If you think your bank is immune to needing a “Cyprus-style Bail In” you are essentially sticking your head in the sand. Are you feeling pretty solid about your bank now? Probably not I suppose. I bet you are wondering what you can do to diversify outside of the dollar and reduce your exposure to the risks presented by over reliance on our failing banking institutions. The good news is that there is a solution that we can all use to help us get through the rocky transition, that will be the failure of our banking system. P.S. Now that you realize the importance of diversifying your savings outside of the central banking system, you should take a serious look at what we are doing with cryptocurrency. I recently wrote a blog post that details your opportunity to get started mining / accumulating cryptocurrency and how you can make a business out of it. Just use the following link to learn more! Want more news, information and education on cryptocurrency in general? Make sure you become a regular visitor of my What Is A Cryptocurrency blog! Hello my friend! It's been a minute, but I thought you'd find this article very interesting so just forwarding the info along to you. 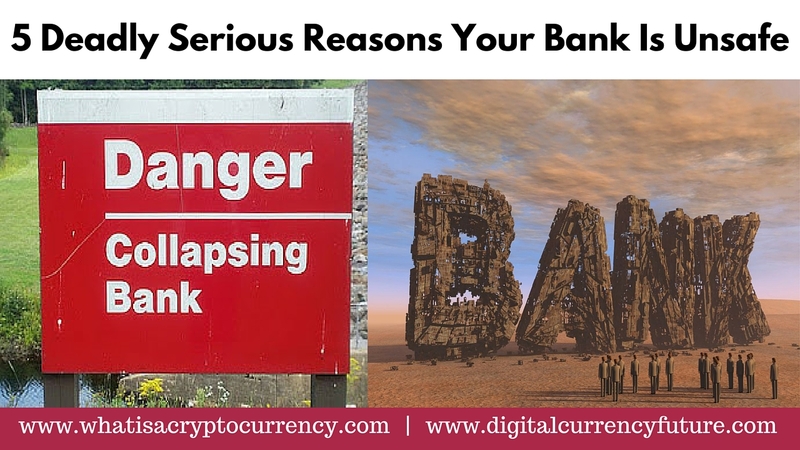 The article is called 5 Deadly Serious Reasons Your Bank Is Unsafeand is located athttps://www.meetcalebwright.com/cryptocurrency/5-reasons-your-bank-is-unsafe/. Let me know what you think!